I’ve been a member of SurveyScout since 2006. I paid the full $34.95 to become a member. People always ask me, is SurveyScout a scam? Is SurveyScout legit? I’ll tell you from a member’s point of view and give you behind the scenes snapshots of the member’s area. Seriously, this is 100% honest; I’m not trying to make a sale and I’m not going to bash SurveyScout and then provide you with a link to another site that you still need to pay to join. I won’t hold back anything! So, the nearly $35 fee, is it worth it? Yes and no. 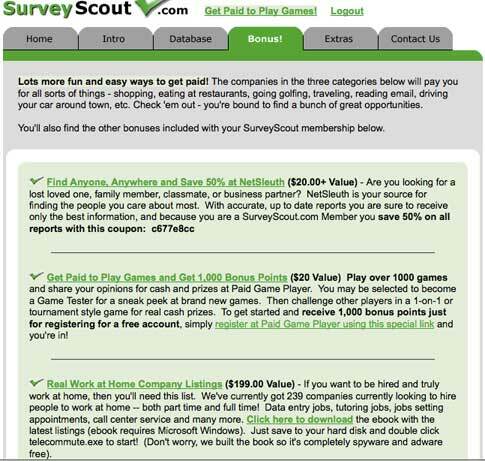 I found SurveyScout to be great when I was first starting out taking paid surveys online. It provided me with a list of paid survey sites to sign up with. I knew I could find most of those site links elsewhere for free, however it is so convenient to have them all in one place in an organized table. As you can see, there are 6 full pages of survey sites. There really are more than you can sign up with. It helped out a lot when I had no idea where to begin. If you’ve already familiarized yourself with the world of online paid surveys then you may think that SurveyScout is a scam. They are basically selling you a list of paid survey sites and some supporting information that, if you look around enough, you can get for free elsewhere. However, if you take the perspective of a newcomer to paid surveys, the $35 fee saves tens of hours of searching for paid survey sites and information on where to being and what other opportunities are out there. One benefit of SurveyScout is that, upon signing up, you get a $25 voucher to a restaurant. I redeemed my voucher to a nearby restaurant and it was 100% legitimate. I ate dinner and handed them the voucher and they took it no questions asked. Vouchers were available to thousands of restaurants, so don’t think you won’t be able to find one near you. 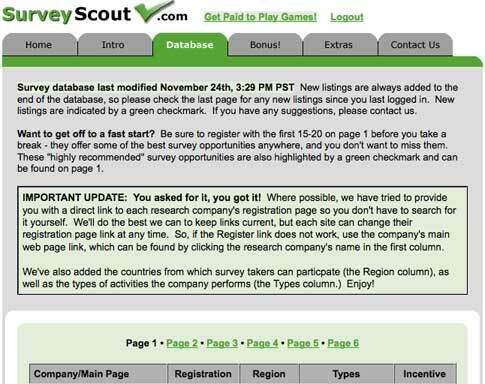 Another benefit of SurveyScout is all of the extra offers and opportunities you get for signing up with the site. Along with links to paid survey sites, you get links to paid email sites, paid to drive sites, and other home-based opportunities like writing articles. Using the links in the bonus section I found out about writing articles online and I have since earned well over $100 from it. They really are useful, yet if you look around the internet long enough, you will find these links for free. The only thing is, with SurveyScout you don’t have to pay to register for these bonus opportunities, whereas if you found them yourself some incur a fee. Even some of the links through SurveyScout require you to pay a small fee. SurveyScout has been around for a long time and no one has any major complaints. Yeah, once you find out that you could have found the links elsewhere you get a little bummed, but then you remember that SurveyScout really helped you get on your way. Would I take the $35 back? No, probably not. I found it to be a great resource for paid surveys, but that doesn’t mean everyone else will think so. I’ve made a few hundred dollars taking paid surveys and I would have to say that I owe some of success to SurveyScout. Would I recommend SurveyScout? Well, even though SurveyScout certainly isn’t a scam, I wouldn’t recommend it to everyone. If you’ve already signed up with a few sites then I would hold back and save your money. If you’re brand new to the online paid survey scene and you don’t want to spend the time to look around for links to register and for recommended sites, then I would say go for it. It will save you time and the $35 fee isn’t all that much. If you’re on a budget, then take a look around this site. We offer a free paid survey database (not as big as SurveyScout’s paid survey database, but pretty close). Click for the free paid survey database. My overall review of SurveyScout is that it offers a great long list of paid survey sites and gives some bonus opportunities, but it is definitely for the beginners and not for advanced survey takers. They don’t directly offer surveys, just the links. So, if you’re already signed up with paid survey sites, it’s pretty useless. If you are a beginner survey taker or feel that SurveyScout can help you out, sign-up by clicking on the link below! Good luck. This entry was posted by Mike on December 13, 2009 at 12:00 am, and is filled under Paid Surveys, Reviews. Follow any responses to this post through RSS 2.0. You can leave a response or trackback from your own site. Should You Have to Pay to Make Money?